This very affordable workbook is designed to help students review what they have learned from reading the textbook. It is organized around learning objectives, which work like a built-in study guide. Multiple choice, true/false, crosswords, word searches, critical thinking scenarios, and other activities test the student’s knowledge of each chapter. It also includes skills checklists and a practice exam for the certification test. Your guide to teaching from our textbook contains the following elements for every chapter: an overview of teaching strategies; page references for both the textbook and student workbook; teaching outlines for every Learning Objective; a chapter review, which may contain case studies, role-playing scenarios, games, discussion questions, two sets of chapter exams, and one final exam. 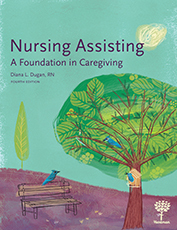 Click here to see other nursing assistant textbooks.